We are proud to be a part of Minden’s past and will continue to work toward its bright future. Here you will be able to find information about our business partners, upcoming events, our community, and what we have to offer both our visitors and our residents. The Minden Chamber of Commerce is organized for the purpose of advancing the economic, commercial, industrial, professional, civic, and cultural interests and general welfare of the City of Minden, Nebraska and its trade area. We are proud to be a part of Minden’s past and will continue to work toward its bright future. Minden, Nebraska is a unique, small community that has a lot to offer its residents and visitors. 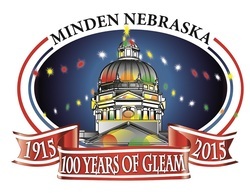 For more information, visit the City of Minden’s website. Thanksgiving - New Year's Day.